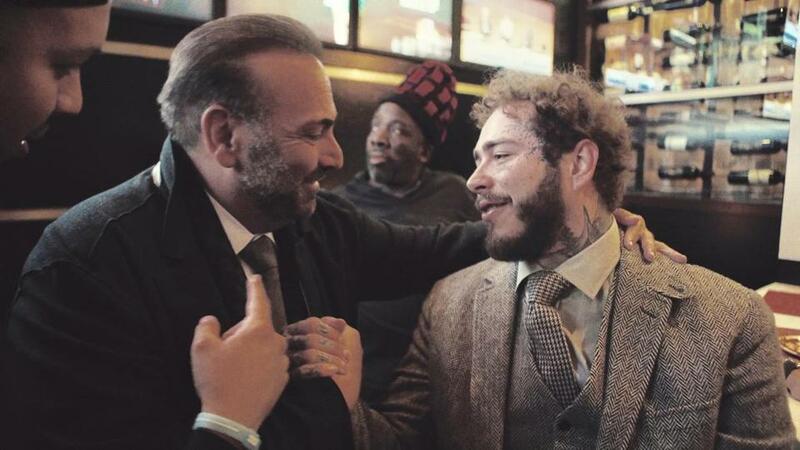 Post Malone chats with Strega owner Nick Varano at Strega Waterfront on Tuesday. With his distinctive face and neck tattoos, rapper Post Malone was easy to spot while in the Seaport on Tuesday night. Malone stopped by Strega Waterfront for dinner, making time to pose for photos with fans and greet restaurant staff. Malone has been spotted around Boston over the last couple of months as he films the Netflix movie “Wonderland.” The crime drama stars Dorchester native Mark Wahlberg as Spenser, the wisecracking Boston detective made famous in author Robert B. Parker’s series of novels, the 1980s ABC show “Spenser: For Hire,” and several TV movies. The film will follow Spenser as he “uncovers the truth about a sensational murder and the twisted conspiracy behind it,” according to a synopsis provided by the studio. Malone’s character in “Wonderland” has not yet been revealed, but Wahlberg did tell “Extra” that Malone attacks him in the film, and that the rapper’s part is larger than originally envisioned.